NOTE: No portion of the story should be distributed or changed. In order to use the story for any purpose, please contact Elder Jackie Williams. While the story and history here is presented in written form, it is important to note that Tlingit stories and histories were traditionally told orally. In oral societies many parts of culture are transmitted via oral interactions. While art, cultural artifacts and practical applications of daily life may be taught through visual learning, history, cultural ideas and structures, language and worldview are all transmitted via spoken word, particularly story telling. As such there are no written records of Tlingit culture from pre-contact, with the exception of pictographic images and other art forms. Converting oral culture into a written format, therefore, has many implications. In the context of “Lingít Kusteeyí: What My Grandfather Taught Me”, the reader must understand that the embodied experience of being in the presence of an elder and on the landscape that the story relates to, is lost. Readers will be unable to hear the subtle changes in Jackie’s voice or his laughter when Ltaaduteen is whipped. They will not have the privilege of seeing the features of the landscape as Jackie describes them. They won’t be able to catch the sharp fragrance of campfire smoke or taste the campfire brewed tea as they listen. In the oral tradition a relationship is built between story teller and listener in which the elder teaches the younger, and the younger gains respect for the elder and learns the stories of their people. This relationship fosters unique relationships, unlike written tradition, which promotes a more individual and solitary experience generally limited to the reader and the written word. Further, oral tradition in Tlingit culture differs from written Western tradition in its concept of ownership. As the published written word is copyrighted, so too are Tlingit stories, but while the written word becomes the property of the author, story tellers are the stewards of Tlingit stories. The storyteller’s role is to look after the story and respect it; the story is not for personal gain. Differences exist in how stories are traditionally told in Tlingit society as well. A story such as “Lingít Kusteeyí: What My Grandfather Taught Me” could be told over a number of days, unlike the written version, which may be read all in one sitting. Indeed, Jackie did not tell the story, as it is presented here, during one story-telling session, but rather told the story many times, with emphasis on different parts of the story during different retellings. Therefore, while the story is presented in the first-person singular voice, it is not a verbatim recording of Jackie speaking. It is important to note that in doing this, certain patterns of speech and repetition that might otherwise be present in traditional storytelling methods are omitted, and that this further alters the oral tradition. These features are important to keep in mind when approaching this story, which has remained in an oral form since its events first took place, but which is written here in order that the story can be shared with a wider audience. Jackie Williams has expressed that the purpose of writing this story down now is so it may always be available to Taku River Tlingit people so they may know their history and stay connected to their ancestors’ way of life, and to help them live in “the right way”. Also, it is important that the Yanyeidí people are recognized as owning the Taku watershed. The story as it appears here represents Jackie Williams best recollection of what his grandfather taught him about the history of the borderlines of the Taku River Tlingit people and is not presented here as a definitive history of the Taku River Tlingit people. 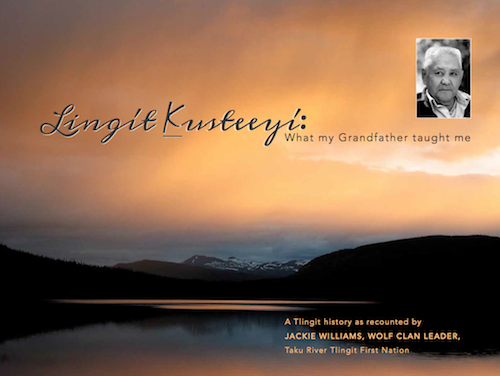 For convenience this story it has been titled “Lingít Kusteeyí” (“Tlingit way of living”), however Jackie’s grandfather did not have a specific name for this story. This story is a compilation (under Jackie’s direction) of many sets of retellings to a few different individuals, in order to ensure all relevant information is captured wherever possible, even if rhythms of speech are not. The story was primarily recounted to Mark Connor during his employment with the Taku River Tlingit First Nation and also to Doug Milek of Round River Conservation Studies. Recordings of Jackie’s story-telling occurred in the Taku River and Atlin area of north-western British Columbia between 2003 and 2011. When applicable, contemporary Tlingit names of people and places have also been used to better reference the specific locations in the story. The Tlingit writing system employed throughout this document is known as the Revised Popular Orthography, originally developed by Summer Institute Linguists, Gillian Story and Constance Naish, and then revised and now promoted by Sealaska Heritage Institute. While Jackie Williams was growing up on the Taku River this story was told to him by his grandfather, Billy Williams. Billy Williams’ Tlingit name was Yáx góos’. At this time Jackie’s nicknames were Jigé and Xóots (“Grizzly bear”). Later Jackie took the name Yáx góos’ from his grandfather when Jackie became the Yanyeidi, or Wolf Clan, leader sometime after his grandfather’s death in 1944. The name Yáx góos’ comes from Yayuwaa Mountain, a mountain figuring prominently in the story of the Yanyeidi of the Taku River Tlingit. Yáx roughly means “face of mountain”, and góos’ is “cloud”, thus Yáx góos’ means “the cloud on the face of the mountain”. Jackie’s grandfather taught “Lingít Kusteeyí”to Jackie at the flats of T'á Héen T'ei.ée (“King Salmon River Flats”). He would ask Jackie to come away from the camp with him to a place near where Xóots Hídi (“the Grizzly Bear House”)used to be, along the King Salmon River. Jackie's grandfather chose a large spruce tree to sit under because he said it was an older, latseeni aas (“powerful tree”). Jackie’s job was to make tea. They would sometimes have dried fish as well. They would toast the dried fish by the fire under the spruce tree and his grandfather would tell him the story. Before he even started telling the story he told Jackie “I’m going to tell you the story of the history of the Taku and where the smokehouses, the villages and the markers were, and after some time I will ask you to tell the story back to me. Remember, there used to be a lot of people living on the Taku, not just a few. You learning this story is like a fish swimming back to where it was born. With this story you will be swimming back to your ancestor’s ways”. In Tlingit this is called yaa nax’ákw (“fish is swimming”). Jackie’s grandfather insisted that Jackie not add anything to the story. He said, “Don’t tell it the way you want to, tell it the way I'm telling you”. If Jackie didn't understand something he would ask about it and his grandfather would explain it. Jackie was asked to re-tell the story back to his grandfather and if he made a mistake his grandfather would correct him and Jackie would tell the story back again a few days later until he got it right. This process occurred in the late 1930’s and early 1940’s. This story I am going to tell is of the war between the Yanyeidí and the Tahltan peoples, whose territory is to the south of that of the Taku River Tlingit territory. As a Tlingit Yanyeidí leader I do not want this story to be changed for anyone’s benefit. It is one complete story of the history of the Taku River and its people. This story is for the Yanyeidí people to keep and should not be altered. The reason for this is because it will be bad luck if people change the story from how it is meant to be told. A long time ago, a glacier extended across the mouth of the Taku River and people did not know the Taku River was there. Because of this the Taku Tlingit originally came up from the coast through the Stikine River, establishing a village at Xalak’ách’ Héeni (“Porcupine River”). This river was called the Porcupine because spruce trees sticking out of the glacier looked like porcupine quills. I believe this is the river they now call the Chutine. From here the Tlingit expanded their trapping and began settling the upper Taku River drainage moving downstream along the Sheslay River. There were many large settlements here. There was a big Tlingit village where the Sheslay and Hackett Rivers meet near a hot spring. Another large village was Taxk’i goon at the confluence of the Sheslay and Nahlin Rivers. Taxk’i goon, which is translated as “water at the foot of the hill”, refers to water coming out of the foot of a bank. The next village downstream was at the confluence of the Inklin and Sutlahine Rivers. It was called Taxk’i Héeni, which means “water coming out of the top of a bank” or “water at the top of a ridge”. The white man could not pronounce this name and changed it to Sutlahine. The bank referred to by the name Taxk’i Héeni has since been washed away by the river. The next village downstream was called Yéil Héeni, which means “crow creek”, and is now called Yeth Creek. The next big village was at Héen Tlein, which is translated to mean “big water”, and was located at the confluence of the Nakina and Inklin Rivers. The white man changed Héen Tlein to Inklin. The confluence of the Inklin and Nakina Rivers is where the Taku River, by name, begins. The village located here was the main village for the Yanyeidi people, and may have had roughly a thousand people living there. The marker here was the mountain called Yayuwaa. There were other settlements in the Taku River watershed, including Katlénxé tú(on Nakina River downstream from Silver Salmon River confluence), at Yéil Táayi (“crow garden”, known as Sinwa Creek), at T'á Héen T'ei.ée (“King Salmon River Flats”), on the Tulsequah River, and at Canyon Island just over the Alaska-British Columbia border. As time went on, the Tahltan began to push the Tlingit out of the Sheslay River country and were even trying to move them out of the Inklin River country. The reason Inklin village got so big was because people were pushed down to it from upstream. The Tlingit met at a potlatch and decided that they would not move any further than Yayuwaa Mountain, which is located at the confluence of Nakina and Inklin Rivers. This mountain is the anchor for the Taku River people and is a marker for the Yanyeidí Clan. At this time, Ltaaduteen was the clan leader for the Yanyeidí people on the Taku. The Tahltan had acquired muzzleloaders from Russian traders on the Stikine River whereas the Tlingit had chased the Russian traders out of the Taku River. The Tahltan knew the Tlingit didn’t have muzzleloaders so they tried to push them even further out of the Taku. At this time there were four big smokehouses on a sand bar on the Taku across the river from the first creek on the east side below the Nakina and Inklin junction. This site was some distance downstream of the main village on the Inklin. It was windy there so salmon would dry quickly. One day women were drying fish there while Ltaaduteen was downriver with his brother and several other Tlingit men. It is said that Ltaaduteen’s older brother was a kind man who helped everybody. The men looked upriver and saw four plumes of smoke drifting downriver. They knew something was wrong. The Tahltan had come and attacked the Inklin village. There were no men in the village at this time. Some of the Tahltan had taken Tlingit canoes from the village to cross the river and were burning the smokehouses and throwing the dried salmon on the fires to destroy the Tlingit food supply for the winter. Ltaaduteen and the other men headed upriver to see what was wrong. Ltaaduteen told his brother and the other men to each follow a different smoke plume. During the battle that ensued, Ltaaduteen’s brother was shot while crossing from one burning smokehouse to another. Ltaaduteen did not see his brother shot, but was told about it by one of the other Tlingit warriors. The Tahltan only had one muzzleloader. At that time the price for one muzzleloader was a stack of furs the height of the gun, so not everyone could afford one. The Tahltan managed to escape using Tlingit canoes to cross to the east side of the Taku River. Once the Tahltan had crossed, they pushed the boats into the river. Since the canoes were not theirs they didn’t care about them. One man was left behind on an island in the river. He was the one who had the muzzleloader. The Tlingit were cautious about approaching him. Finally Ltaaduteen, who was angry because his brother had been shot and killed, entered the water. He was shot in the head by the muzzleloader, but his birch bark headband deflected the bullet. Back then birch bark was treated with grizzly bear blood or grease to offer greater protection. This was because the ‘spirit’ of the grizzly bear blood provided power. Ltaaduteen was knocked out and collapsed into the river. The shock of the cold water revived him. The Tahltan was trying to reload his gun. In those days when a person killed someone they said, “Ho ho ho ho ho.” While the Tahltan was saying this, Ltaaduteen got up and said, “Don’t you ho ho ho ho me”, and speared the man, killing him. The other men who had taken the Tlingit canoes escaped. When the Tlingit men returned to the village at Inklin, they found that an important Tlingit woman that was viewed by the Yanyeidí people almost like a princess was missing. The people searched for her, and found that the Tahltan had killed the woman and impaled her on a tree on the Tlingit trail going up the Inklin River. She was left at a spot on the trail where she would be easily found. The location of this tree was on the north side of the river along the Inklin trail upstream about three miles from the Nakina River confluence where a bluff comes down to the water. This bluff is named after this woman. It is believed this spot was chosen as the site to impale the woman because it was near Yayuwaa Mountain, and was a way of saying, “This is what we think of the Tlingit marker”. When the Tlingit cremated this woman she was laid to rest on the south side of the Inklin River on a hill straight across the river from where she was killed. She was laid to rest away from other cremated people because she gave her life for Mother Earth. Although my grandfather did not specify, she was likely placed in a spirit house after she was cremated. After this battle, there were many meetings amongst the Tlingit to decide what to do. The Indian doctor, known as Íxt’, listened to these meetings as they decided that the best way to go about it was to have a war. The Indian doctor got his power from the animals. He said that he would plan how the Tlingit nation of the Taku could attack the Tahltan and how to train the warriors. It took one whole year of training before the attack was made. The Indian doctor chose the Sinwa waterfall, known as Latseeni Sinwaa Shaa Héeni (“Powerful Limestone Mountain Water ”as the site for the Tlingit warriors to train. At this waterfall the water flows straight out of the mountain. It was chosen because it is sacred. It was thought to be powerful and purifying water because it flowed directly out of Mother Earth. This waterfall was well marked for the Yanyeidí of the Taku by a hemlock tree. The hemlock has significance for the Yanyeidí because the first house built by them was made of the brush of a hemlock tree in Alaska. The hemlock tree is a marker for the Taku Yanyeidí people wherever the trees may be. It was fall when the warriors started to train. The Indian doctor told the warriors not to have relations with their wives until the war was over because they had to remain pure. The warriors would go under Latseeni Sinwaa Shaa Héeni and when they came out Ltaaduteen, who was now the captain of the warriors, would whip them with red willow to make them tough and strong. Ltaaduteen was chosen as the captain of the Tlingit warriors because his mother had escaped the Tahltan and told him stories of how she was treated as a slave. There is a story about this as well. It was the fall after his mother escaped that Ltaaduteen’s brother was killed at the battle of the smokehouses. After that Ltaaduteen was very anxious to go to war. For this reason he was chosen as the leader of the warriors. Ltaaduteen had to go under Latseeni Sinwaa Shaa Héeni as well. Once when Ltaaaduteen was under the falls, one of the warriors grabbed the red willow and started to whip Ltaaduteen even though he was the captain. Ltaaduteen was running away and the warrior was chasing him with the willow saying, “Feel this too!” My grandfather said this had to happen because theyneeded a laugh once in a while. Even though they trained hard it wasn’t serious all of the time. The warriors also trained by running along a trail that went around the small limestone mountain that has the canoe painting on it. This mountain is known as Sinwaa du dachxán (“limestone grandchild”). They would travel over the trail to the sacred waterfall then back down again. The warriors trained all winter, and that spring when everyone had fish traps at the village of Héen Tlein the Indian doctor, Íxt’, said, “There is something coming up the Taku, fix up your traps as good as you can”. The Indian doctor said the first place this thing camped was at the T'aakhú Téix'i (“Taku Heart”). T’aakhú Téix’i marked the limit to which the ocean backs the river water up during high tide, and so is a marker of the boundary between the Taku Tlingit and the Éil’ ká ku.oowu Lingít (“salt water people” or coastal Tlingit people). The Indian doctor said the next day that this thing camped at Canyon Island. The following day the Indian doctor said this thing camped at L'el Tóoli (“Yellow Bluff”). And the following day he said this thing camped at S’oow Héeni which means “blue water” in Tlingit, and is now known as Zohini Creek. Then on the next day the Indian doctor said this thing camped at Graveyard point. Then it camped at the place the water hits the bluff above King Salmon Creek on the east side of the Taku River. From there the thing camped at the rock paintings on Sinwa du dachxán at Sinwa Mountain. On the eighth day it was camped at the Inklin and Nakina River confluence. In the morning of the ninth day everyone got up really early in the morning and the Indian doctor pointed to one fellow and said, “It’s in your trap”. The fellow went down to the river and a huge Chinook salmon was caught in his trap. It was so big it could only fit half way into the trap. The men took the salmon and cleaned the fish as well as they could, and the Indian doctor said, “We will keep this for your last lunch before you attack the enemy”. The Indian doctor said to the warriors, “Some of you who are going to go to war don’t believe what I tell you. I told you this thing was coming up the river and where it camped so that you would believe what I have told you about the battle and how you can do it without getting killed”. The Indian doctor planned which way they were going to go to attack. They planned how to get up to the place where they were going to have the war. The reason they planned was because they did not want the Tahltan Indian doctor to see them coming. The Tlingit Indian doctor believed the Tahltan didn’t have a good Indian doctor, but they still didn’t want to take a chance. The Tlingit plan was to go to Yéil Héeni and up to the top of the mountain on the east side of the creek. Once on the top of the mountain they were to travel along the mountaintop to the confluence of the Sutlahine River where there was a Tlingit village that had been taken over by the Tahltan. The Tlingit name of this village was Taxk’i Héeni, which means “water coming out of the top of a bank” or “creek on top of a ridge”. The reason the Tlingit Indian doctor chose this route along the top of the mountains to reach the Tahltan village was so that the Tahltan Indian doctor would not be able to sense them coming. Some Indian doctors could sense things almost like modern day radar. The Tlingit left for battle in the fall just when the snows began to come. My grandfather said the Tlingit war department had a meeting with the Indian doctor and the warriors. The Indian doctor said, “We are going to start off tomorrow and we will start at Yéil Héeni. Talk to your wives and children and tell them we are going to come back stronger than when we started off”. Then the Indian doctor took a drum and started drumming and said, “We are doing this together to protect the Tlingit land of the Taku River. This land to the headwaters of the Taku River belongs to the Tlingit”. Then Ltaaduteen said, “Let’s start off”, and they headed to Yéil Héeni. At Yéil Héeni, their first camp, the Indian doctor said, “This is as far as I go; now you will be on your own. “Believe what I have told you about how we are going to win our land back”. The Indian doctor said, “Some of you warriors do not yet believe what I have told you about how to protect yourself and come back alive. I will tell you again what will happen. When you camp tonight, go early in the morning to the edge of the mountain and you will be told how many days until you will see your enemy. Also, when you get to the enemy camp there will be smoke so the enemy will not see you approach. The head man for the Tahltan will have red colored hair”. The Tlingits thought of this red-haired leader as a dangerous and bad person. The Tlingit used to say of him that he would rather kill than eat. The story of how he got his red hair is that as a child his father killed a man and rubbed the dead man’s blood into the boy’s hair. Afterward the boy’s hair stayed red. This red haired leader was the instigator of much of the conflict with the Tlingit, and he was well known for his killing. That night they camped on the top of the mountain above Yéil Héeni. The next morning they said, “Let’s go find out how many days until we will see our enemy”. The warriors went to the edge of the mountain right at the top of the snow slide that goes directly into Inklin Canyon. While they stood there they heard a wolf howl four times from down in the Canyon. When they heard the wolf they looked at each other and said, “We had better do what the Indian doctor told us if we want to come back alive”. Then four of the warriors stood in a row and said, “We believe what our Indian doctor tells us, and we are going to walk with our Indian doctor’s way to fight our enemy”. When the warriors had been on the trail for about two days, their wives approached the Indian doctor and said they were worried about their husbands going into battle. The Indian doctor told the women that the warriors would be following the ‘right way’ and everything would be all right. While he was saying this, an owl was heard hooting in the forest. The Indian doctor told the women that the owl hooting was a sign of good luck. The Tlingit used the north wind and changed directions as they approached nearer the Taxk’i Héeni village. This means they used the power of Mother Nature’s north wind to help them. The warriors traveled on and by the fourth day they arrived at Taxk’i Héeni, the village the Tahltans had taken over, where they saw a big smoke on top of the village. They descended a little creek down to the village. This creek was also covered in smoke and no one could see them approach. As they descended they took out the dried salmon they had prepared from the huge Chinook that was foreseen by the Indian doctor and divided it amongst them. Some of the warriors didn’t finish their salmon and put it in their coats. The warriors drank water from the spring that Taxk’i Héeni gets its name from. This is powerful water because it comes from Mother Earth. Then Ltaaduteen asked, “How many teepees are down there?” There were forty two teepees down there, and there were forty two warriors down there. The Indian doctor had told them how many teepees they would find. Ltaaduteen told the warriors which teepee each should take. There was one Tlingit warrior for each Tahltan teepee. Then they waited until the people went to bed. Ltaaduteen told them to kill the men but not the women and children. When Ltaaduteen gave a whistle they would all attack at once. Ltaaduteen then stood back and gave a bird whistle. When the Tlingit warriors speared the men they heard a loud commotion, which was probably people hollering. Then one man ran out of a teepee. I guess this man may have expected this attack might happen because he ran up the hill but he didn’t see Ltaaduteen standing there. The man was running without a spear when he passed Ltaaduteen. Ltaaduteen chased the man but could not catch him so he threw his spear, impaling him through the mid-section. The speared man kept running up the hill as if nothing had happened. After the battle that night they kept all the fires going; the Indian doctor had told them to have four fires going in a square pattern and to stay in the middle. The following morning at daybreak they went after the speared man. They found him sitting under a tree looking down the way he had come up. He was sitting in a position as if he was going to kill someone coming after him using the spear Ltaaduteen had speared him with. Ltaaduteen told one of the young warriors to go up there and spear him, but the warrior backed off because the man looked so dangerous. Ltaaduteen then walked up to the man and knocked him over because he knew he was already dead. The Tlingit warriors all cheered once they saw the man was dead and said “we’ve got our land back”. Ltaaduteen said, “We got the head man and we don’t have to worry now”. This man was indeed red haired and therefore the leader they had heard so much about. After his death the Tahltan stopped pushing the Tlingit out of the territory. Ltaaduteen told the warriors to make a circle around the village and look for tracks leading out.One of the Tlingit warriors came back and reported tracks running up the river. They looked where the tracks had come from and they found a little hut by itself away from the village. This hut was where a young woman had been placed when she reached her first period. Her boyfriend had snuck over to visit her, which was something he was not supposed to do, and had no spear when the battle started. He ran barefoot all the way back to Taxk’i goon at the confluence of the Sheslay and Nahlin Rivers, a distance of over fourteen miles. Ltaaduteen sat down with the women and told them to pack up and move upriver out of Tlingit territory. Ltaaduteen made sure every woman and child left for Taxk’i goon. Ltaaduteen told some of the elder women that the Tahltan should move right out of the Taku watershed. As they stood by the fire after the war some of the warriors said, “You know, I didn’t eat all my fish up as I was too anxious to get this war over with”. Then Ltaaduteen spoke up and made an offering of the fish to the fire to help find a way to live in peace with the Tahltan. Ltaaduteen walked around the fire four times and said, “We ask for peace with the Tahltan, for our young generations to get along, and for the Tahltans to acknowledge that we, the Tlingit of the Taku River, own all the headwaters of the Taku”. The Tlingit warriors cremated the dead bodies. They did not cremate them in the same way they would have cremated a Tlingit. For example, they did not dance around the cremation fire; they just burned them. There must have been a lot of people to burn. After that the Tahltan moved out of the Taku headwaters. When the Tlingit warriors returned from the battle they used the same route as when they had come over the mountain to Yéil Héeni. They used the same route so as to remain pure until they got to where they had left the Indian doctor at Yéil Héeni. Then the Tlingit headed back to the Héen Tlein village. When they got back to Héen Tlein they found that all the Tlingit had come to the village to await the warriors return. When they got into the village everyone welcomed them back to the village at the Yayuwaa marker. Offerings were made to the river in thanks for the reuniting of the families. They had a celebration with feasting and singing and offerings. At the celebration the wives of the warriors all got together and said they were happy to have their husbands sleeping with them again. During these celebrations, a song was made that recounted the story of the war. Part of the song was about Yayuwaa Mountain. My grandfather used to sing this song, but I cannot remember it now. At this celebration new laws were made for the Yanyeidí people called Lingít kusteeyi or “Tlingit way of living”. Yayuwaa Mountain officially became the marker for the Yanyeidí people of the Taku. All the people made offerings together in the river to make this ‘official’. The Indian doctor said to the warriors, “Go back to Inklin Canyon and you will see that animal that hollered at you four times”. So four of the warriors went up to the canyon and came back and said to the people at the celebration, “The wolf that howled four times has turned into a rock”. The Indian doctor said that this stone wolf is the marker for the Yanyeidí people that had made war. “That wolf will be a marker that says that this is Yanyeidí territory. This Tlingit land is governed under the Yanyeidí”. This stone marker is called, Yóo gooch áx’ woogaaxi yé (“the wolf’s rock”) or the “Cry Wolf”, and is still there today. Over time Yóo gooch áx’ woogaaxi yé has eroded; it used to have more distinct ears and snout. This celebration went on at Inklin for eight days. A leader was appointed then as a Yanyeidí leader. Before this there were leaders, but after the war the Tlingit entered into a new government. They wanted this new government and new law to be recognized by others so they could tell them how things were going to be in the Taku. The Tlingit discussed how they were going to approach the Tahltan. One respected man suggested they appoint the Indian doctor to arrange a meeting. The Indian doctor sent a message boy to the Tahltan and told him to tell the Tahltan to meet the Tlingit in July at the border of the Taku and Stikine watersheds and that there was going to be new laws that governed the Taku. One of these laws was that there needed to be messengers between the Tlingit and the Tahltan, but that no harm should come to the message boy. The Tahltan could have their own messengers as well, and they would not be harmed.When the message boy returned he said that the Tahltans agreed to meet at the boundary of the Taku and Stikine watersheds and they would send their own message boy to tell them when they would be there. The Indian doctor told the Tlingit people that the meeting place would be at Léik’w Tóoli, which is a rusty red hill in the upper Hackett River drainage about three miles above Hatchun Lake. The Indian doctor looked ahead and said, “We are going to have a little problem. The Tahltan won’t agree to Tlingit law”. So the Indian doctor made a plan to convince the Tahltan to agree with Taku River Tlingit law. The plan was to get all the Tlingit to volunteer to dress in war costumes. These volunteers were the warrior’s wives, who were of the Crow Clan. The Crow Clan has rights to use the Taku, but the control of laws in the Taku falls to the Yanyeidí(Wolf) people. The plan was to have these volunteers hide behind Léik’w Tóoli where the Tahltan couldn’t see them. Then Ltaaduteen would give a sign and wave to the volunteers when it was time to come out. When the Tahltan and Tlingit met atthe border of the Taku and Stikine watersheds(the upper Hackett River), the Tahltan had quite a few warriors and outnumbered the Tlingit. Both sides sang a song and these songs were to settle the agreement. As Ltaaduteen was singing, “We want to settle our agreement at the watershed”, he put a spear in the ground and said, “The headwaters of the Taku River belong to the Tlingit people of the Taku”. The Tahltan said, “We don’t have to agree with your plan because we outnumber your warriors right now”. Then Ltaaduteen sang a song and waved his hand and the people behind Léik’w Tóoli came out. Then right away the Tahltan leader knew they were outnumbered. He put his spear in the ground and said he agreed that the Tlingit own the headwaters of the Taku River and the Tahltan own the headwaters of the Stikine River. Ltaaduteen put his hands up to stop the Crow women in warrior costumes from coming down the hill. Ltaaduteen put another spear down, and said the agreement on the territories is official, and the Tahltans said, “We will make it an official deal that the Tlingit own the headwaters of the Taku River and the Tahltan own the headwaters of the Stikine River”. With this the Tahltan headman put the fourth and final spear into the ground. The reason the spears were stuck in the ground was to make this deal official and to symbolize an agreement involving Mother Earth. Right away the Tahltan asked when they were going to have a celebration together. The Indian doctor spoke up and said, “I would like the Tahltan to tell us where they would like to meet for the celebration”. The Tahltan leader said, “We will let you know with our message boy”. The Tlingit Indian doctor said, “Those are good words. I hope we can work together as neighbors”. The celebration between the Tlingit and Tahltan happened at Léik’w Tóoli sometime after this meeting. When it did happen the Tlingit came with both the Crow and Yanyeidípeople so they outnumbered the Tahltan. The Indian doctor who organized the Tlingit warriors is now laid to rest at the confluence of the Nakina and Inklin Rivers. He chose this site to be cremated and put in a spirit house so he would be able to look upon Yayuwaa Mountain, the marker for the Yanyeidí people. Ltaaduteen and his brother may have been laid to rest in spirit houses at the mouth of Yéil Héeni. After the war, a limestone hill was named after Ltaaduteen’s mother who had escaped from the Tahltan years before. This limestone hill was named for her because it is located near where she rejoined her people. It is a landmark seen from the Taku River and is located at T'á Héen T'ei.ée. And that is the story my grandfather told me of how the Yanyeidí people established the borders of Taku Tlingit Territory in the Taku River watershed.